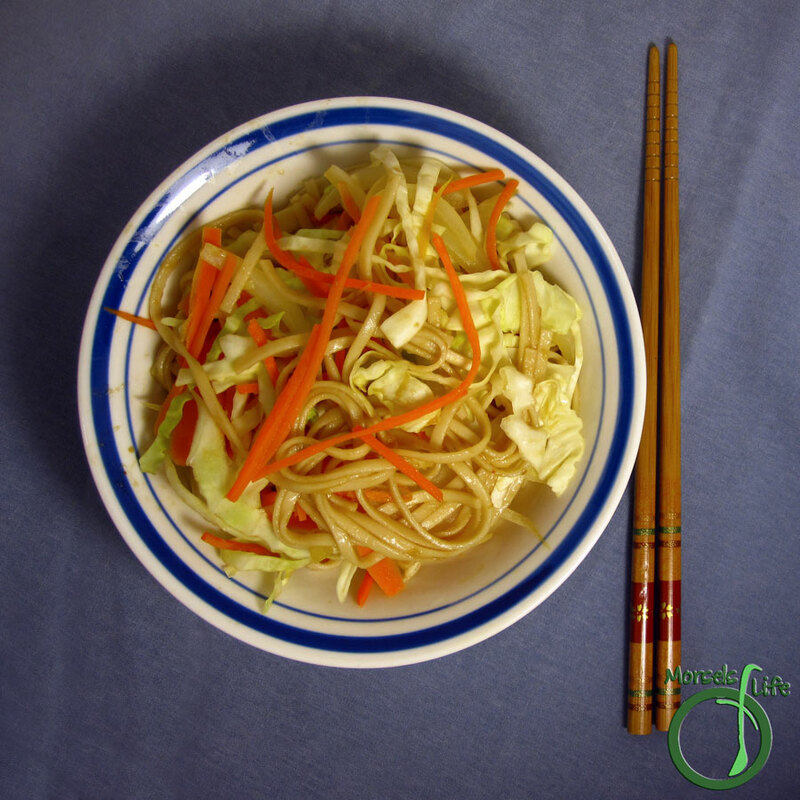 Stir fry chicken and any vegetables you have around with some noodles for a quick, easy, and tasty yakisoba. Let me just start off by saying - I'm pretty sure this yakisoba doesn't score high on authenticity. However, it does more than make up for it in tastiness! In many ways, this yakisoba is like the noodle version of Fried Rice - you can make it quickly and easily while using up any odds and ends you might have lying around. Yakisoba, or fried noodles, derives from the Chinese Chow Mein. Even though Yakisoba contains the word "soba," meaning buckwheat noodles, yakisoba is normally made from wheat flour noodles and contains various meats and vegetables stir fried together with soy sauce. I opted for carrots, onions, and cabbage, but you can use whatever odds and ends you happen to have around. In Japan, yakisoba is usually served with many toppings, but I opted to go simple and serve without lots of extra toppings. You could serve yours either way, and it'll still be some tasty eats. You can even make yakisoba-pan. Just make the yakisoba and put it into a sub - with or without the extra toppings. :) Or use udon noodles and make yakiudon instead. How will you make this dish - as yakisoba-pan, yakiudon, lots of toppings, just the basics, etc? Cook ginger in a small amount of oil until fragrant. Add chicken and cook until done. Meanwhile, cook noodles following package directions. Add vegetables to chicken, cooking until tendercrisp. Drain noodles, and mix in sauces with noodles and sesame oil. Combine noodles and chicken/vegetables until mixed. Nice flavours here. Thank you for sharing this recipe. Yum! This looks great. Thanks for sharing at Must Try Monday. Sounds like this Yakisoba would be perfect for you - it combines Fried Rice and noodles. :) Thanks for featuring it on Saturday! This looks really wonderful. Rice AND noodles? So naughty. Just what the doctor ordered!